Congratulations for thinking of building a rain garden! We want your garden to look good and function beautifully. 12000 Rain Gardens website presented by Stewardship Partners for comprehensive rain garden info. 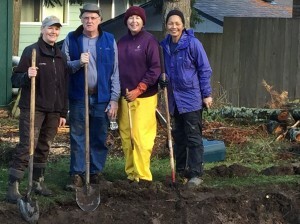 Video: Building a Rain Garden in the Pacific Northwest – A 32 minute video detailing how to build a rain garden. Catching Rain factsheet on rain-garden-construction – A checklist for constructing your rain garden. 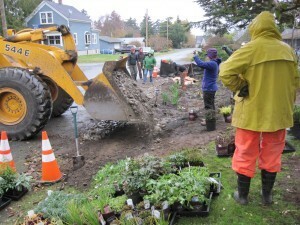 Catching Rain factsheet – rain garden construction sequencing – The order of constructing your rain garden. Catching Rain factsheet – rain garden maintenance – Key maintenance tips for your new rain garden. If you have more questions please contact your County Extension rain garden expert.